This set is ideal for beginners and professionals alike. It comes complete with ten 12ml tubes of acrylic paint, two 22ml tubes of acrylic (one white and one black), three brushes, two painting boards, two sketching pencils, one eraser, one sharpener, one plastic mixing palette, one plastic palette knife, an instruction leaflet, and a sturdy wood artist box. 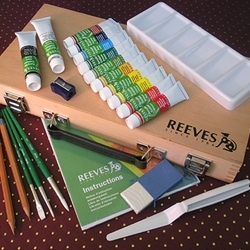 Perfect for class, studio work, travel, and painting en plein air.